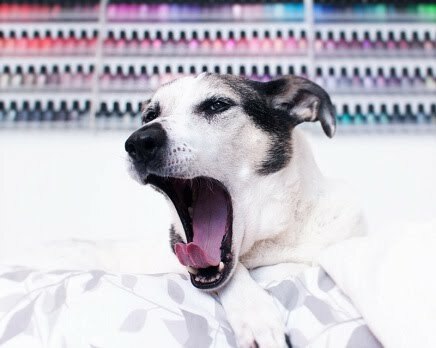 Polish Hound: [Guest Post] Paint Those Piggies! : Negative Space with OPI Nordic Shades! [Guest Post] Paint Those Piggies! : Negative Space with OPI Nordic Shades! Hey everyone! Today's guest post comes from Erin of Paint Those Piggies!. I can't quite remember how I first stumbled upon Paint Those Piggies!, but I was immediately drawn to Erin's lovely long nail beds, awesomely diverse nail art, and killer swatches. She's one of my favorite bloggers to read, and a really lovely person too! I'll let Erin tell you all about this design! Hi everyone. My name is Erin and I run the blog Paint Those Piggies! I am so excited to be guest posting for Cait while she is on vacation. I have been a big fan of her blog and her adorable dog for quite some time! Today I have some nail art incorporating a few new things. First, I just got the best box ever with the OPI Nordic collection in the mail over the weekend and this was my first time using them. Second, I've only done one other negative space mani and I really enjoyed it so I wanted to try it again. Here's what I came up with. I wanted to create stripes that had a Summer to Fall transition to them, so I started by cutting little pieces of blue painter's tape and applied them all to my nails. I chose my colors and then used a small nail art brush to fill in all the spaces between the tape. After removing the tape I cleaned up the stripes and finished with topcoat. In order, the colors I used were OPI Suzi Has a Swede Tooth, OPI Can't Afjord Not To, OPI Thank Glogg It's Friday, OPI Skating on Thin Ice-land, and OPI How Great is Your Dane? I hope you guys enjoyed this look, I know I enjoyed creating it ;) Thanks again to Cait for letting me guest post, hopefully she is having an awesome time in Colorado! These are some nice stripes and negative space manicure! I still have yet to do a negative space design so I might have to give them a try. Awesome guest post!